Got Texas Rangers team spirit? 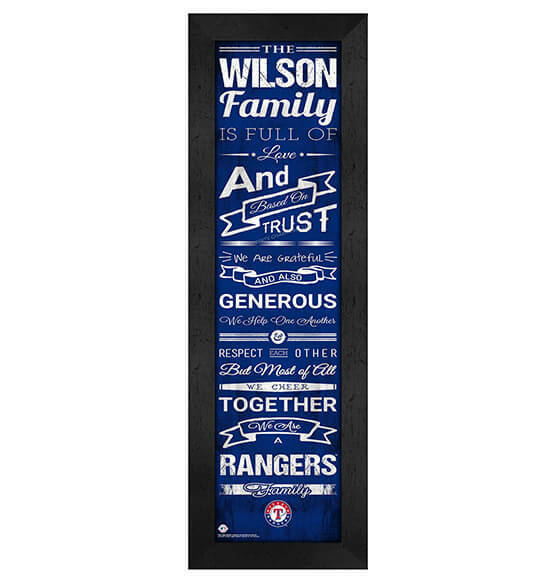 Sport this MLB team's colors and logo proudly while commemorating the love of your family with our fine Personalized Family Cheer Texas Rangers wall art from PersonalizedThings by Exposures. This vintage-style print comes with an installed sawtooth hanger for easy mounting and features a vertically hanging, eye-catching style that is guaranteed to be a conversation starter. Complete with heartwarming family sayings and a customizable surname up to 12 characters, this MDF vinyl-wrapped and glass-protected print is sure to be a sports decor addition that will be cherished in your home for years.